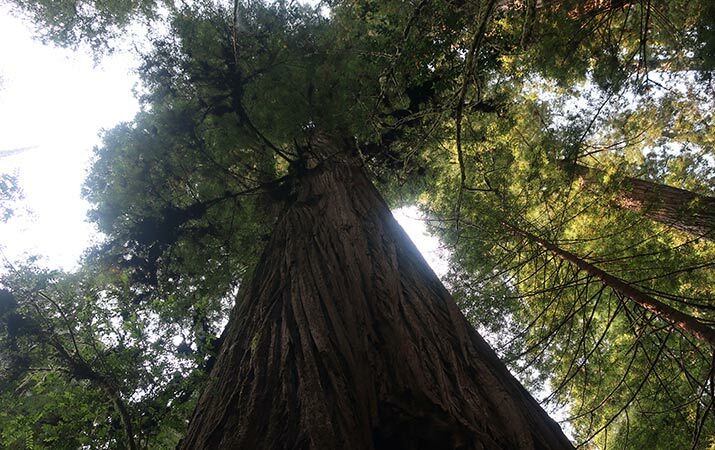 On the Redwood Coast in northern California, explore largest remaining groves of old-growth redwoods, the tallest trees in the world. Due to conservation efforts beginning more than a hundred years ago, this unique World Heritage Site, which includes Redwood National and State Parks, preserves the coast redwoods for generations to come. Here’s our tips for family trips to the Redwood Coast, how to identify coast redwoods, different park areas, hiking, beaches, and wildlife. 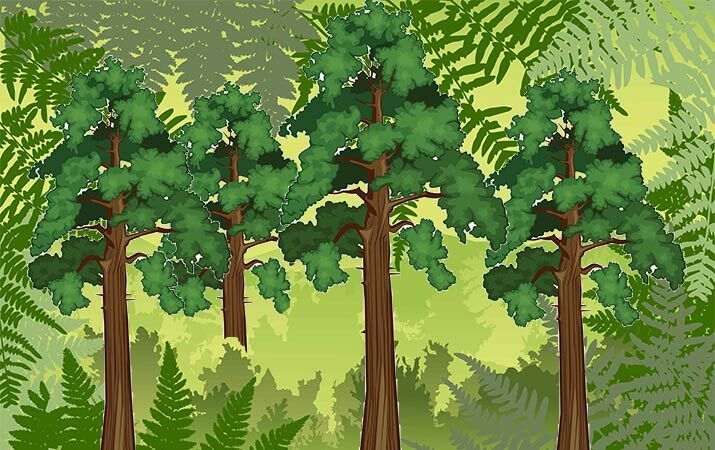 The tallest trees in Redwood Coast forests are coast redwoods, but there are other evergreen trees with cones, and Douglas-firs also grow over 300 ft. tall. How to identify a coast redwood amidst all the other trees? Height is a clue, but the shape of the coast redwood is distinctive. Coast redwoods grows straight up, and when mature, do not have many lower branches. Western hemlock and Sitka spruce are shaped more like a Christmas tree, with lots of branches coming out from the trunk. An ancient Douglas-fir can look similar to a coast redwood, but their cones are very different. Another distinquishing characteristic of coast redwoods are burls, gnarled bumps on the tree. Coast redwoods can grow from seeds or from sprouts, buds grow out from these burls. Other cone-bearing trees in the forest reproduce from seeds only, do not have these burls. The bark of the coast redwood is red and deeply furrowed. There are other red bark trees in the forest, but their trunks or leaves are different – Pacific madrone, the bark peels away revealing a smooth inner trunk, or western red cedars, leaves are fan-shaped sprays, instead of redwood needles. Coast redwoods need lots of fresh water, and don’t grow on cliffs right next to the ocean, where the air is salty. In those locations, you’ll find trees such as Sitka spruce. 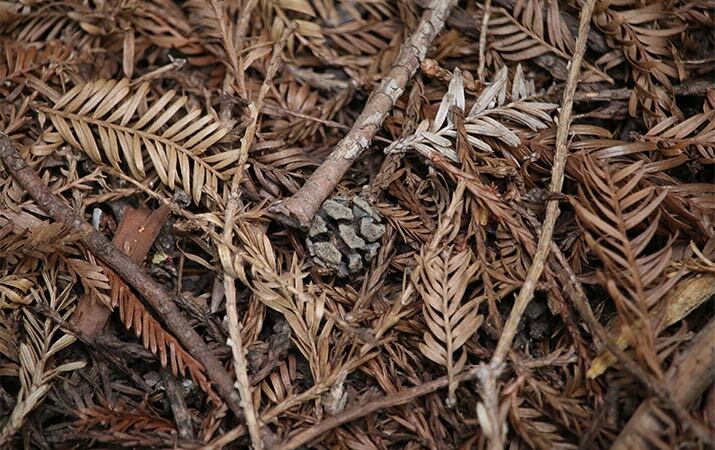 The easiest way to be sure a tree is a coast redwood is to look at the ground for its cones. The coast redwood cone is remarkably small (photo above) and unlike other cones in the forest. The Redwood Coast extends from Humboldt County in northern California to the Oregon border. It’s an area over 100 miles long, and Highway 101 is often a two lane highway, some gravel roads are slow going. Don’t rush, plan to spend more time in one area, rather than driving every day. National and state parks preserve not only the redwoods, but also prairies (grasslands), meadows, rivers and streams, and beaches along the coast, with different wildlife and marine life in each area. Each state park has a visitor center, where you can pick up trail maps, see exhibits, pick up souvenirs in the gift shop, and ask questions. 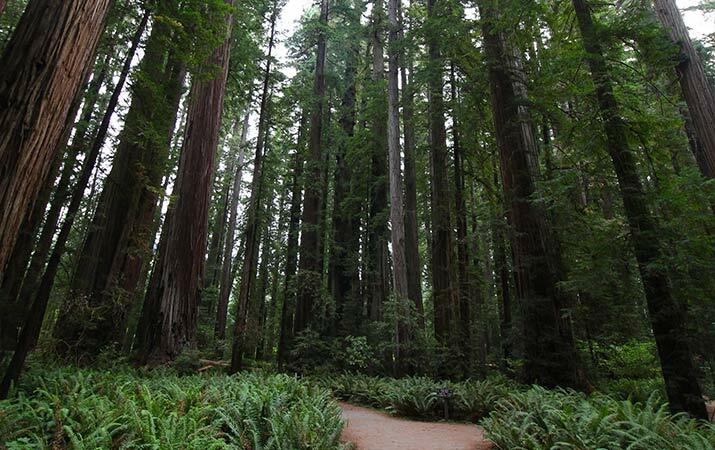 For Redwood National Park, the largest visitor center is in Crescent City (1111 Second St., near the city park), two other visitor centers are Hiouchi Visitor Center (near Jedediah Smith Redwoods State Park) and Kuchel Visitor Center (just south of Orick). There are miles of family hikes in the redwoods, from short nature and loop trails, easy for toddlers, to longer hikes where teens can stretch their legs. Bring water bottles – Creeks and streams look sparkling clean, but don’t drink the water (especially in Fern Canyon, where people are walking through the water). Stay on trails – Don’t wander off the trails, this is a complex forest ecosystem where too many footsteps smashing small seedlings prevent forest renewal. Watch for poison oak and stinging nettles along the side of some trails. Have water shoes to wade in low water streams in summers (a must for Fern Canyon). Even when it’s cloudy, hats and sunscreen are a good idea. Restrooms – In the state and national park areas are numerous picnic areas, visitor centers and trailheads with restrooms. Encourage kids to use the facilities before setting out on a hike. Dirt roads – Getting to some hiking trails requires driving down winding unpaved roads, such as Howland Hill Rd. (Jedediah Smith Redwoods State Park), or Davison Road to Fern Canyon (Prairie Creek Redwoods State Park). These dirt gravel roads are not suitable for motor homes or trailers. Foggy weather – Summers on the coast are often foggy and can be chilly. Sometimes the mist clears by noon, but may stay gray all day. Bring light jackets or fleeces for days at the beach. Beaches on the Redwood Coast are very scenic, but the water is cold and “sleeper” waves and rip current are dangerous. Don’t swim or wade in the ocean. 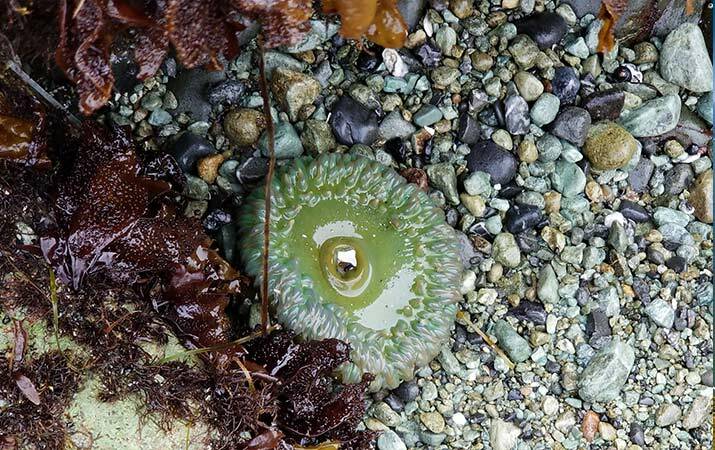 Tide pools – Kids have fun exploring the tide pools – look for purple and orange sea stars, black turban snails, giant green sea anemones, sea urchins, crabs. There’s also super seaweed, including bull kelp, feather boa kelp, Turkish washcloth, rockweed. Check the tide tables to know when it’s low tide. Also, rocks can be quite slippery with seaweed, wear waterproof sandals or water shoes. Don’t throw pebbles into the pools, this will squish creatures trying to survive low tide. Also, please don’t poke fingers into the sea anemones (it’s hard for them to recover). Gray whale watching – November to April or May, look for gray whales migrating each year. 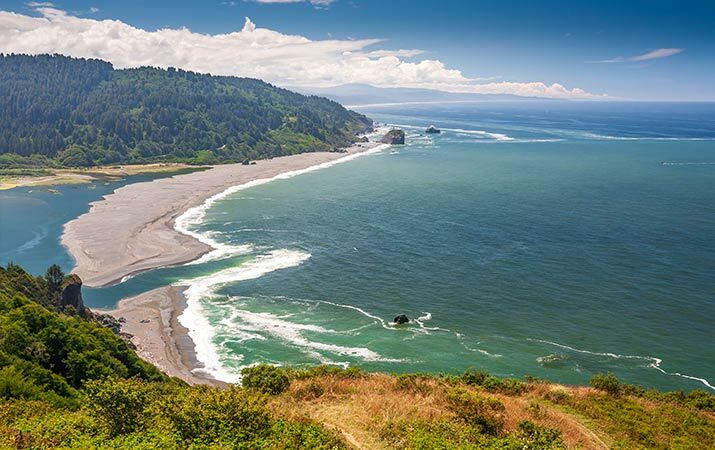 Best spots to see them – Crescent Beach Overlook, Palmer’s Point at Patrick’s Point State Park, and Klamath River Overlook. Don’t feed the animals – Chipmunks and squirrels are excellent at looking cute, but “people” food (especially chips) is bad for their health. Elk – Roosevelt elk live in the parks, look for them in the grasslands (prairies) and meadows at Prairie Creek State Park, also at Gold Bluffs Beach and Crescent City Beach. 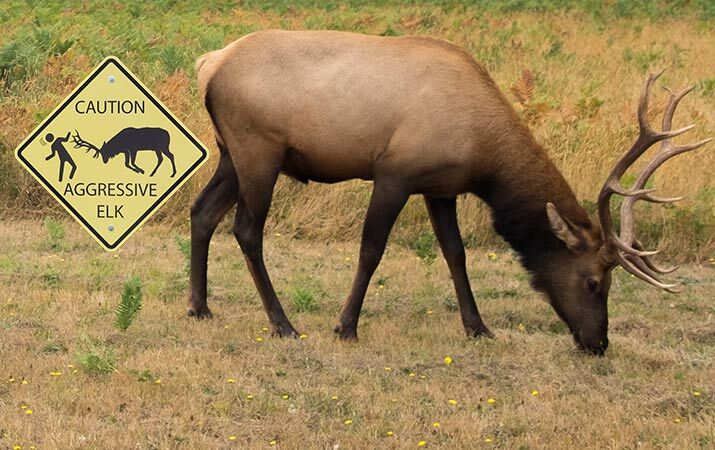 Do not get close to the elk, especially in mating season, late August to November. Yellow banana slugs – What can we say, those lemon yellow banana slugs are fun. Find them in the redwood forests, easier to spot in open areas, on fallen logs. To plan your trip to the Redwood Coast, read all our “fun things to do with kids” on Travel for Kids website – including Redwood National and State Parks, and towns of Eureka, Arcata, and Crescent City. Editor’s note: Nothing in our photos, videos, or writing really captures what it feels like to stand in a redwood grove – towering trunks reaching into the sky, mist and sunlight filtering through the trees, wispy lichen floating on branches, lush ferns and wildflowers on the forest floor. Come experience the redwoods in person.